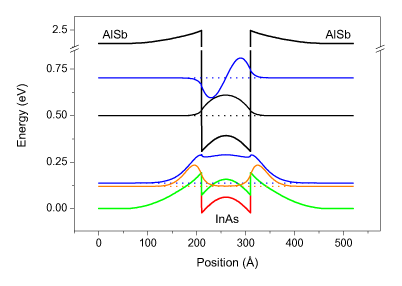 Self consistent valence and conduction band potential with envelope wave functions of AlSb/InAs/AlSb quantum well structure calculated from eight-band k•p theory. Heavily doping leads to type II --> type I transition due to the strong valence band bending. 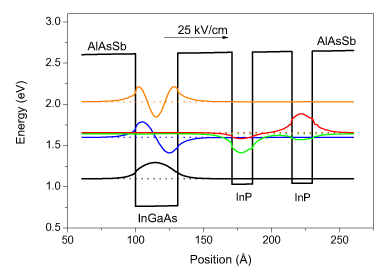 Valence and conduction band potential with envelope wave functions of AlAs0.56Sb0.44/In0.53Ga0.47As/ AlAs0.56Sb0.44/InP/AlAs0.56Sb0.44/ InP/AlAs0.56Sb0.44 triple quantum well structure biased with a dc electric field. Wave functions are calculated from eight-band k•p theory. 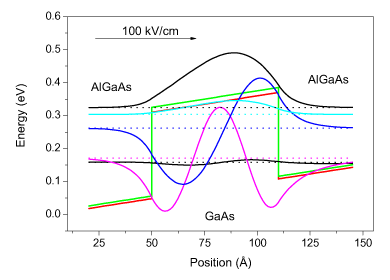 Valence band potential with envelope wave functions of Al0.5Ga0.5As/GaAs/Al0.5Ga0.5As quantum well structure calculated from four-band Luttinger-Kohn model. The structure is biased with a dc electric field and is under in-plane uniaxial compression in  direction. 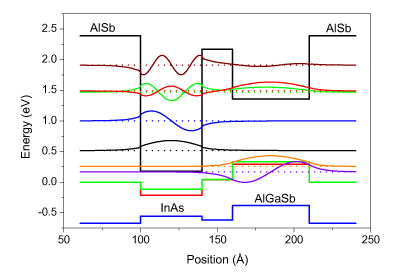 Valence and conduction band potential with envelope wave functions of AlSb/InAs/Al0.9Ga0.1Sb/ Al0.2Ga0.8Sb/AlSb double quantum well structure calculated from eight-band k•p theory.